Russia make the perfect start to the tournament with a hammering of Saudi Arabia in the opening match of the 2018 World Cup. Russia won the tournament opener in a 5-0 margin. Yuri Gazinskiy and Cheryshev struck first-half goals to open their international accounts at Luzhniki Stadium, Artem Dzyuba adding a third 89 seconds after his introduction as a second-half replacement, but an injury to star man Alan Dzagoev will cause concern for Russia. Dzagoev hurt his hamstring in the opening period and could be a doubt for the rest of the tournament, depending on the results of a scan. Gazinskiy headed in Golovin’s cross to score the first goal of the 2018 event, with Dzagoev’s replacement Cheryshev lashing in the second before the interval. 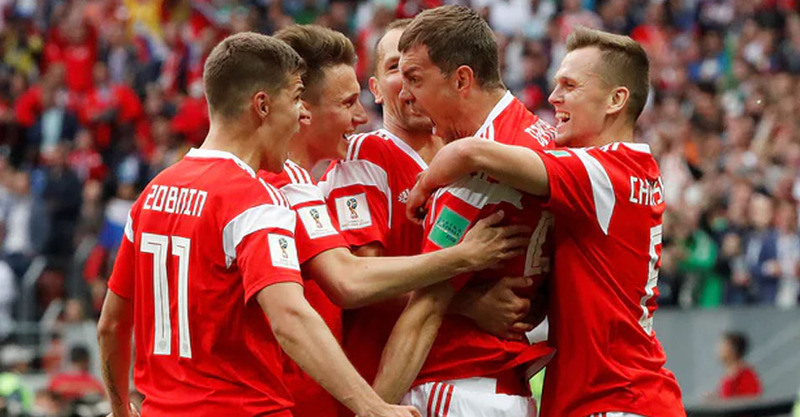 Russia started the World Cup as the lowest-ranked team in the tournament but the hosts were a class above Saudi Arabia, Dzyuba’s header stretching the lead in the 71st minute. Cheryshev showed he could be the man to fill Dzagoev’s shoes with a fantastic injury-time goal, finding the top corner with a sublime shot with the outside of his left boot, before Golovin bent in a brilliant free-kick to finish the match in style. Juan Antonio Pizzi’s men struggled to create a chance of note, failed to record a shot on target and gave away possession on countless occasions, enabling Russia to record their first World Cup win since 2002.